Education is the best asset of a nation.Educating a girl is one of the best investments her family, community, and country can make. Educating a girl in particular can kick-start a virtuous circle of development. Women's empowerment is essential for economic development, growth, and poverty reduction not only because of the income it generates, but also because it helps to break the vicious cycle of poverty. With this vision NCWEB started by Delhi University is an endeavor to contribute to Higher Education not only by enabling girlstudents to get a degree in relevant subjects but also inculcate in them the ability to think creatively and to possess good communication skills.Programs such "BetiBachaoBetiPadhao" would only be successful when institutes such as NCWEB blossoms fully. Only women students residing in the National Capital Territory of Delhi can enroll themselves as students of the Board. NCWEB is a unique system with lectures on weekends, leaving students with five working days to follow their dream. In this neo-age of 100% cut-offs class room crunch, gender discrimination, NCWEB is a welcome initiative and a most satisfactory way to attain a degree from the prestigious Delhi University. The Non-Collegiate Women's Education Board teaching center at Maharaja Agrasen College was started in June 2011 which was earlier functioning at different educational institutions of EastDelhi. The academic session 2017-18introducedonline admission process which facilitates a hassle-free access to education for the students. At present the enrollment in Under Graduate courses at the Maharaja Agrasen College Centre of NCWEB is approximately 1342 and of which around 506 and 836 are in B COM and BA(P) respectively. With around 44 teaching staffs and a dozen non-teaching staffs, the center has successfully completed the 52 days class schedule for the academic session 2016-17. The number and percentage of successful students in annual exams-2017 of the University is also encouraging. The results are far better than previous year's result.Out of 506 students of BCom, 501 students were successful in the exam. The percentage of successful students is 99% which is very encouraging. Out of 836 students who appeared in BA(P) exam, 819 students achieved success and again the passing percentage was97.96% which is healthy and encouraging for the center. The academic year of NCWEB, Maharaja Agrasen College Centre started with an orientation programme held in August 2017. During this interactive sessionthe students were informed about the various aspects of NCWEB. Apart from the academic activities extra-curricular activities are also important for the overall personality development keeping this in mind an annual sports and cultural competition "Spardha-2017" was organized at NCWEB, Maharaja Agrasen CollegeCentre on the 26thDecember,2017.cultural events like; painting, creative writing, self-created poem, slogan writing, mehendi, rangoli, solo singing, group singing as part of Spardha 2017-18, in which the students participated in large numbers anddisplayed huge interest. The students of street play team of the NCWEB, Maharaja Agrasen College Centrein collaboration with Department of Social Work participated in a play/skit on 19th March, 2018 organized by Pahal and Care India on women empowerment. They also bagged the second position in the competition. 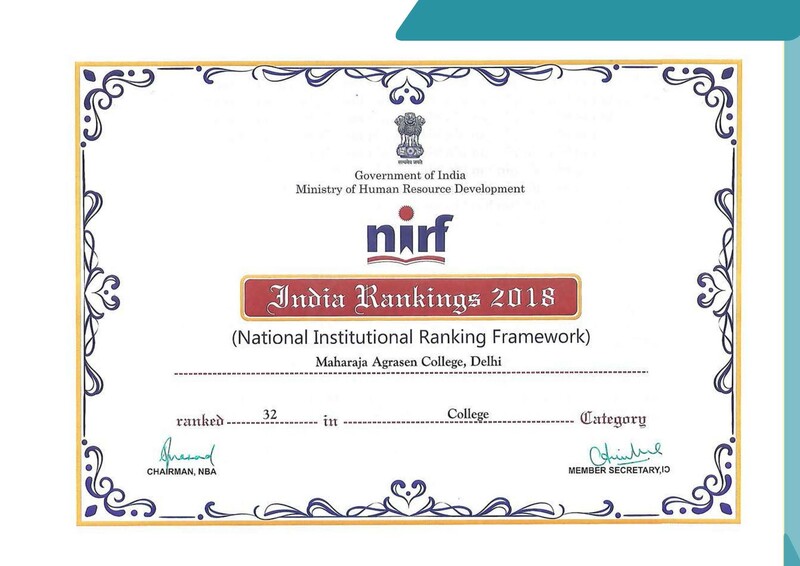 Maharaja Agrasen College Centre is trying its best to provide every possible opportunity to the students of NCWEB in order to harness their untapped potential and prepare them to make their career and contribute in the process of nation building.